HomeContent ManagementHow is Custom Content Management System the future of Online Businesses? If the content is the king of the digital world then content management system is the commander of this kingdom. A content management system is basically a platform which allows non-technical personnel to manage content. It includes web-based publishing, indexing, format management, history editing, version control and etc to support the creation and modification of digital content. But should the CMS sustain till here only? No, its time for customisation. The big, modern, multitasking businesses are now looking for one-screen solutions where all its managers, employees and executives work together on daily basis. Take, for example, content creators need tools to create, store, organise and distribute content. Marketers need tools to analyze content and gain traffic and traction. Executives want to see the overall performance of content in light of comparative analysis and compel metrics. Search engine optimisation specialist, designers and other consultants would also play their role in this task. Now, for all of this, a custom, flexible approach to technology is required or you can say a logical CMS platform which integrates all the tools that enterprises use daily. What kind of businesses should opt for custom content management system? Well, if you are a small business and wish to remain small then I will never suggest you a custom content management system. For you, WordPress and Drupal would serve as right content management software because here they would perform decently on managing a traditional website; a collection of pages. But if you are looking to build high performance and modern websites, may it be commerce or informational, it demands more customised approach. 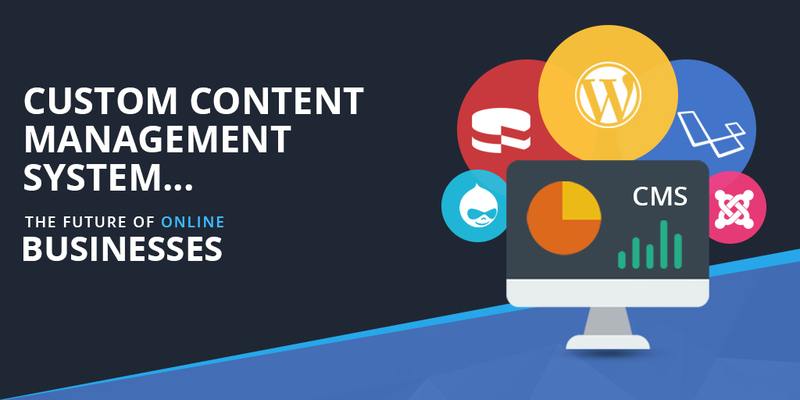 A custom content management system acts as an answer for all requirements of performance, responsiveness, search engine optimisation, and etc at one place. It allows you to build and maintain a website which is as per your business, your workflow, and your needs, not as per what others think is important. The customisation lets you deliver content-rich results with superior user experience. How custom content management makes more sense than a pre-made one? A custom content management system has fewer security holes as it is solely made for your business. It is difficult for hackers to damage such architecture. For specialised and proper functions, a custom content management system is the best. The open source content management system comes with a variety of different functions which may not be of your use also. A custom content management system is built from a scratch ensuring that all the needs of your clients are met efficiently. Since it is so customised, it is easy to learn, operate and navigate. As a custom content management system is solely developed for an individual client, updates are only required when a new function has to be added. The new function should be compatible with the older ones in order to have smooth functioning. With custom content management system, the entire control is in your hand. So, if the content is your commodity then the custom content management system should be your weapon to control your business. Don’t get confused, just evaluate your business needs and operation level before taking a call of integrating a custom content management system into your business.